Client Challenge: World Rugby wanted to enhance its fan experience in order to further engage existing fans and draw new spectators to Rugby Sevens. Solution: Over the course of a Rugby Sevens season and in its capacity as Innovation Partner, Capgemini took World Rugby on an innovation journey, to discover, devise, and build digital technologies that will enable rugby fans to interact with, engage with, and be ahead of the game of Rugby Sevens. New tools for fans to engage with rugby matches and their favorite teams. Rugby sevens is already one of the most exciting and entertaining sports in the world, but the development and increased importance of data and insights in sports provided an opportunity for the use of data analysis technology to engage with fans. This meant that World Rugby, the international organization that oversees and manages global rugby competitions, needed a process that would allow it to innovate and expand the impact of data on the representation of rugby and the overall fan experience. To begin this process, Capgemini became the Innovation Partner of World Rugby. This collaboration built upon the shared values of the two organizations, which included a mutual interest in and admiration of the sport and a passion for developing a best-in-class experience for the fans. In addition, both organizations understood the importance of an agile methodology when pursuing innovation; this was based off of Capgemini’s Discover, Devise, Deploy, and Sustain approach. This joint interest and approach cemented the partnership and ensured that World Rugby and Capgemini began the journey with a solid foundation based on cooperation and coordination. For the first year of their collaboration, Capgemini and World Rugby wanted to narrow their focus for innovation to one specific area and selected the fan experience. With this decision made, the organizations had an established purpose for changing the way in which key stakeholders, including both new and existing fans as well as commentators and the media, engaged with the sport. The Discovery process began at the Capetown tournament in December of 2017, where Capgemini set up a design workshop led by its Idean team and supported by the Innovation and Data team, which conducted a data recovery on player and team performance. Throughout the event, the team walked stakeholders through three days of design-led thinking to develop emerging concepts for further exploration. This group included officials, referees, administrators, commentators, players, coaches, managers, and media representatives, ensuring that Capgemini and World Rugby benefited from a multi-faceted view of the rugby experience. In addition, Capgemini took the opportunity at Capetown to interview fans in order to fully understand the persona, needs, and wants of different types of fans from first time viewers to long-term supporters. The partners recognized that the new fan experience would have to take these differing levels of engagement and interest into account. 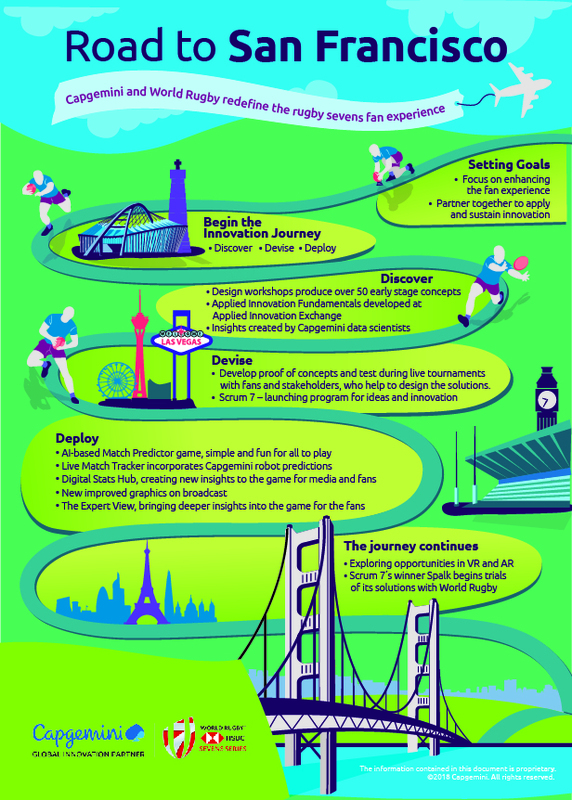 Capgemini combined all the inputs from the Capetown workshop – in addition to research into other sports and technology innovation – to present World Rugby with a comprehensive view of the innovation journey and create over 50 early-stage concepts for innovation within the fan experience. Capgemini then set about working with World Rugby to challenge, refine, and prioritize the initial set of concepts. To do so, the Innovation Partner hosted additional workshops in London and Dublin during January 2018, to which it invited a mixture of stakeholders who had attended the previous event and those who had not been able to take part. Once again, this group had a variety of experience with rugby sevens, ensuring that input from these events reflected a wide range of knowledge and engagement. Each workshop began with Applied Innovation Fundamentals at the Applied Innovation Exchange (AIE), Capgemini’s global platform designed to enable enterprises to discover relevant innovations and to contextualize and experiment within their specific industry. At this point, the early innovation concepts were presented for consideration. This was followed by a transition to the Accelerated Solutions Environment (ASE); a Capgemini facilitation team that supports organizations as they transition from solution design to implementation. During this stage, the Insights and Data team presented the output of its performance review as stakeholders were guided through a process that pared down the concepts into a more manageable set of eight ideas that Capgemini and World Rugby could focus on in the first stages of the innovation journey. By the end of the London and Dublin workshops, Capgemini and World Rugby had agreed upon a path forward that would focus on changing the narrative and language around rugby sevens in order to provide deeper insights into the sport. This culminated in a joint innovation list that identified the main themes to pursue and defined three core data groups that together could measure performance: Potency of Attack, Efficiency in Defense, and Possession. It was at this point that the Road to San Francisco began to accelerate and the partners could begin working towards enhancing the fan experience. With a mutually agreed upon path established to launch World Rugby’s innovation journey, the partners began the Devise phase by developing the concepts into tangible deliverables. Over the three and half weeks between the Dublin workshop and the rugby sevens tournament in Las Vegas in March 2018, Capgemini developed initial prototypes of a Match Predictor game and a comprehensive Digital Stats Hub, both of which were introduced at the tournament for live testing by stakeholders. The Match Predictor game is an interactive application that allows players to select the expected winners and margin of victory for every game as part of a simple league. Users can test their knowledge of the match ups and compare teams head-to head to see how they’ve performed relative to each other in previous matches. By adding a new level of interaction with the competition, Capgemini and World Rugby created a more engaging fan experience. Meanwhile, the Digital Stats Hub brought more digitalization and greater organization of the existing database maintained by World Rugby. Previously, game commentators would receive paper print outs of relevant statistics and match up details. But with the Digital Stats Hub, they began to receive a digital output in real time to quickly compare the history of each match up and pull the most relevant data to the forefront. This experience is now being extended to the media and will eventually reach the broader fan base. Following the successful roll out of the prototypes to stakeholders at Las Vegas, Capgemini developed a new version of the Match Predictor game for the Vancouver tournament one week later. For the next iteration of the game, the Insights and Data team added the Capgemini bot, which used match history and data analysis to make outcome predictions for each match. This provided fans with a new competitive element through the implementation of Artificial Intelligence (AI) and machine learning into the fan experience. Following this second test, Capgemini and World Rugby continued to develop and refine the Match Predictor game and the Digital Stats Hub at a series of tournaments in Hong Kong in May 2018, London in June 2018, and Paris, also in June 2018, each time benefiting from a new round of feedback from stakeholders, media, and VIPs. This involved setting up and supporting a genius bar in every corporate box to collect feedback and create solutions. The final proof of concepts for the Match Predictor game and Digital Stats Hub were introduced at the London tournament. In the meantime, development began on a Live Match Tracker, which provides live updates of each match as it progresses, a particular challenge with a game as fast-paced and volatile as rugby sevens. In addition, the tracker also involves the Capgemini robot, which generates a prediction of the results at the starting whistle that can then be compared to the actual match. Heading into the Rugby World Cup Sevens tournament in San Francisco at the end of July 2018, Capgemini and World Rugby have made significant strides in evolving the match experience for fans. Already, the Digital Stats Hub has enhanced media output, including commentary and sport analysis that can be consumed by fans of varying levels of experience. Meanwhile, Capgemini began the Deploy stage by working with Pulse, World Rugby’s fan experience team, to add the Match Predictor game to the downloadable World Cup application that will be available at the San Francisco World Cup tournament. Already, Capgemini and World Rugby have identified the Digital Stats Hub and Live Match Tracker as the core of their 2019 development. This will involve a downloadable version of the Digital Stats Hub for fans, for whom it will provide easily digestible statistics that will offer further insights into every match. The World Cup will involve previews of both solutions ahead of their final rollout next year. In addition, the partners are following the examples of other sports organizations by exploring opportunities with Virtual Reality (VR) and Augmented Reality (AR) to further improve the fan experience. This includes concepts such as a virtual t-shirt cannon, in which fans use their mobile devices to win a voucher for a t-shirt instead of an employee firing t-shirts directly into the crowd. With the launch of every new technology, Capgemini will continue to support World Rugby as part of the Sustain phase of its innovation methodology. Throughout the journey to this point, Capgemini and World Rugby have together established themselves as effective and determined innovators. World Rugby’s knowledge of the sport and its fans provided invaluable insight and guidance for delivering a new, data-based fan experience. By supporting World Rugby with its agile and collaborative approach throughout the innovation journey, including establishing themes and objectives, developing a solutions, and deploying new tools to enhance the fan experience, Capgemini has demonstrated an unparalleled ability to develop and execute an innovative vision based on its partner’s unique challenges and interests. As a leader in delivering digital transformation, Capgemini is poised to work with World Rugby to deliver an entirely new fan experience based on the Match Predictor game, refined Digital Stats Hub, Live Match Tracker, VR, and AR, which will form the future of rugby sevens and enable fans to be ahead of the game. World Rugby is an international regulator and investor in rugby. It has successfully steered the growth and development of the global game to record levels of participation through investment driven by its flagship tournament, Rugby World Cup, and strong governance worldwide. World Rugby grows participation, engagement, education, and regulation of the sport with innovation by harnessing rugby’s character-building values to excite, engage, and inform new audiences in existing and new rugby markets.